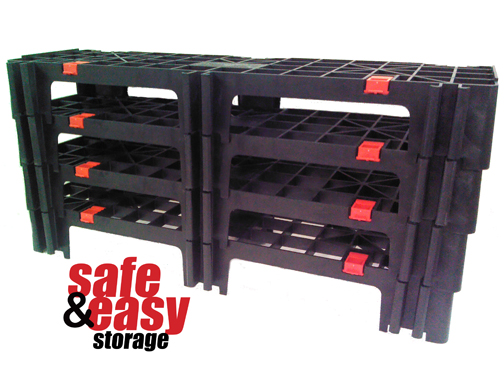 The Fast Lock Modular Plastic Pallet is an adaptable interlocking pallet system that allows you to lock together identical sized pallets (40" x 12" x 6") to create the custom sized pallet you require. If you're requirements change, they unsnap and re-snap together to form a new configuration. 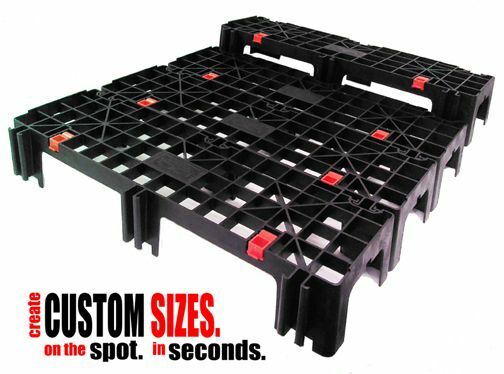 This unique pallet system means no more wasted space because you had to use a standard size pallet. You simply snap together as many individual 12" pallet sections you need to create the size required for each specific application; it's that SIMPLE! They also nest before and after the job, which is perfect for shipping, in-house movement, returnable or closed loop solutions. CONNECT UP TO 8 PIECES to make the following sizes - 40x12, 40x24, 40x36, 40x48, 40x60, 40x72, 40x84, and 40x96. 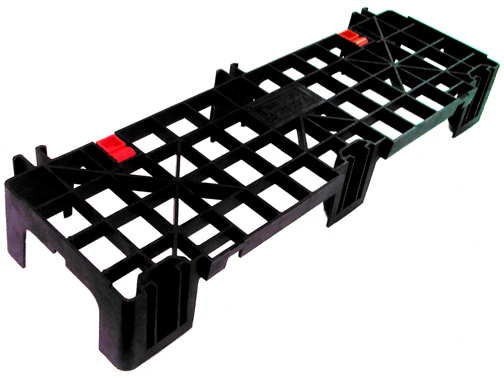 Patent pending technology allows individual pallet sections to interlock together to form custom sizes. Patent pending locking feature allows for quick and easy assembly and disassemble. High density polyethylene, structurally molded materials. Can connect up to 8 pieces to make sizes from 40 x 12 up to 40 x 96. Durable solid body one-piece construction. These plastic skids are lightweight, yet durable and strong. Lip integrated feature helps reduce product movement. 4-way fork lift and hand truck entry (US and EU). 100% recyclable. Buyback program available. 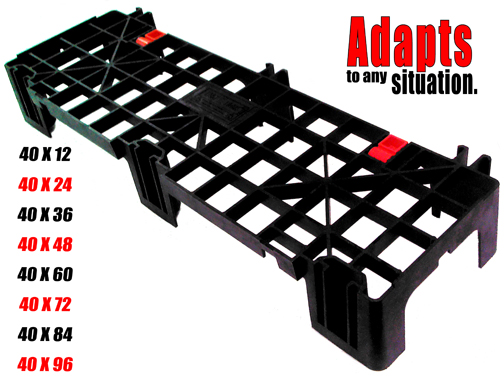 Offer you the adaptability to create custom sized plastic pallets quickly and efficiently. Reduced shipping costs by allowing you to create a more efficient shipping footprint so you are charged only for the space you actually need. 35" lighter than most wood pallets. Meets highest standards for cleanliness and safety. Will maintain standard dimensions throughout the lifetime of the pallet. No broken boards or protruding nails that can injure your employees or damage your product. Will not absorb liquids and are impervious to infestation, therefore meeting or exceeding all GMA standards. Dims. (L-W-H): 40" x 12" x 6"
Tare Weight - 5.8 lbs. each.